Rev. J. Donald Monan, SJ, died on the morning of March 18 at the Campion Health Center, a Jesuit facility in Weston, Massachusetts, following a long, slow physical decline. He was 92, and his last days were spent in the company of family, close friends, and brother priests. A teacher, philosopher, civic leader, and the longest-serving president in the history of Boston College—1972 to 1996—Monan had long been credited with leading the University out of a deep crisis of finance and spirit and to national prominence. At the time of his death, he was the University’s inaugural Chancellor, an honorific he’d been awarded when he stepped down from the presidency. Known as Don to his intimates, JDM to generations of University memo writers and readers, and Fr. Monan to the rest of the world, James Donald Monan was born on December 31, 1924, in the town of Blasdell, New York, population circa 1,500, some 10 miles south of Buffalo. His father, Edward, was a superintendent of bridges and tunnels with the New York Central Railroad. (Buffalo was a nexus for the NYCR, and there were 10 train depots in Blasdell alone when Monan was a boy.) Monan’s mother, Mary (Ward), kept house, looking after Donald—a name he self-selected over James when he was still in grade school, according to family lore—and his siblings Edward Jr. and Gertrude, five and four years older than their brother, respectively. The children were raised within a close extended family. Edward Monan Sr. was one of nine children whose parents had emigrated from the rural Ards Peninsula, in Northern Ireland’s County Down, in 1870, prospering as grocers in Buffalo’s Irish First Ward. Monan recalled in a 2009 interview that his American family was fond of singing—Monan himself was a deft tenor—and of storytelling, and often talked about life in “Portaferry.” Monan later came to know and cherish Portaferry and its environs, which he visited following completion of doctoral studies in Europe in the late 1950s. “One of the most moving experiences of my life,” he said of his first glimpse of the Monan family farm on a spit of green land overlooking the Irish Sea. He developed and for all his life maintained friendships with relatives who remained in Ireland. Jesuit studies took him first to St. Andrew-on-Hudson, a novitiate near Poughkeepsie, New York, and then to Woodstock College, some 20 miles west of Baltimore. Woodstock was the oldest Jesuit seminary in the United States and the “leading Catholic seminary” of the time, according to the New York Times. Monan earned bachelor’s, philosophy, and theology degrees there and was ordained in 1955. Among his teachers was John Courtney Murray, SJ, the most eminent American Catholic theologian of the mid-century, whose work focused on finding compatibility between the tenets of democratic pluralism and those of Catholicism, and who would be called upon to help draft Dignitas Humanae, the Second Vatican Council’s revolutionary “Declaration on Religious Freedom.” Another of the young Monan’s teachers was Gustave Weigel, SJ, a noted ecumenist and pioneer in interreligious dialogue. Monan also worked as a driver for Murray and was on the staff of Theological Studies, a leading Jesuit journal that Murray edited. While Monan, regrettably, is not known to have written about his years in Woodstock, he spoke of Murray and Weigel as important influences. In his book Echoes of a University Presidency: Selected Speeches (Linden Lane Press, 2008), Monan cited counsel he’d received from Weigel when he was a doctoral student in philosophy. “If you study philosophy solely for its apostolic value to you as a priest,” Weigel wrote in a letter, “it will make you a poor philosopher and a poor apostle; if you study philosophy for its own intellectual validity, you will have the possibility of being a respectable philosopher and being more effective in your ministry as a Jesuit priest.” Monan adopted that counsel wholeheartedly. In many talks over the years to Boston College faculty, he referred to sound academic work as an essential contribution not merely to a particular science or art but to the University’s Jesuit mission. Fr. Monan earned his doctorate at the Catholic University of Louvain, in Belgium, in 1959. His dissertation, which focused on the development of Aristotle’s idea of ethics, was titled “The Doctrine of Moral Knowledge in Aristotle’s, Protrepticus, Eudemian and Nichomachean Ethics.” While in Europe, Monan studied for a year at Oxford, and for another year divided his time between the universities of Paris and Munich. He returned to the United States in 1960 to take up a position as a philosophy instructor at Le Moyne College, in Syracuse, New York. Founded in 1946, Le Moyne was a very young institution, and Monan’s gifts for administration were noted and recognized with a rush of appointments. Within a year he’d been named chairman of his department and a trustee of the college. He was named to lead Le Moyne’s honors program the following year. He served on the college’s Budget Committee, Academic Senate, President’s Advisory Council, and Student Life Council. He was appointed a higher-education consultant to the New York Provincial in 1966, and named a trustee of Fordham University in 1969. In 1968, Monan accepted his first full-time, senior administrative job—as Le Moyne’s academic dean—while Oxford University published his dissertation under the title Moral Theology and its Methodology in Aristotle. Though long out of print, the book is still cited on occasion in studies of Aristotle. The famous and famously acerbic Duke University theologian Stanley Hauerwas, in his 1994 book Character and the Christian Life, found Monan’s philosophical ideas attractive (though he cautioned the author—by then a 22-year president of Boston College—that he was no historian). An essay-length appreciation of the book appeared only four years ago in the Review of Metaphyics. Whether or not Monan was aware of these attentions, I don’t know. I do know that he was amused and pleased more recently when he was told that Moral Theology occasionally turned up on eBay, and that it was priced a good deal higher than the five dollars for which it sold when it was first issued. During the four years between 1968 and his departure for Boston College, Fr. Monan served in quick succession as Le Moyne’s academic dean, academic vice president, and acting president. In the early summer of 1972, just as Boston College was launching its search for a president, Monan gave up the Le Moyne acting presidency and set out on a sabbatical—a season of golf to be followed by a season of research—from which he expected to return to his career as a teacher and scholar. But neither the sabbatical nor the academic position came to fruition. Shortly after he left Le Moyne, Monan was contacted by a Jesuit friend who asked him if he’d interview for Boston College’s position. Monan was reluctant. “I told him,” Monan recalled, “that four years as academic dean and vice president had convinced me that I much preferred teaching and writing.” But his friend persevered. What the slim man accomplished as president of Boston College is the subject of the stories that follow. The University, however, was hardly his only commitment. Over the course of his four and a half decades in Boston he served as a trustee or director of more than a score of foundations, corporations, and organizations. These ranged from the National Association of Independent Colleges and Universities to the Bank of Boston to the WGBH Educational Foundation. He also was appointed to a similar number of committees that assisted such organizations as Massachusetts General Hospital, Harvard University, the NCAA, the Massachusetts Foundation for the Humanities, the Peter F. Drucker Foundation, and the National Leadership Roundtable on Church Management. He was the recipient of 13 honorary degrees and numerous awards, including the Theodore M. Hesburgh, CSC, Award from the Association of Catholic Colleges and Universities, and the Distinguished American Award from the National Football Foundation and Hall of Fame. At the time of his death, he remained a member of the Metaphysical Society of America, the Jesuit Philosophical Association, the Society of Ancient Greek Philosophy, and the Society of Phenomenology and Existential Philosophy. In 2011, Fr. Monan was honored by the New England Province of the Society of Jesus with its Ad Majorem Dei Gloriam Award—for the Greater Glory of God. Editor’s Note: Fr. Monan is survived by nephews Patrick, Edward, and Michael Monan, Kevin Cheeley, and Anthony J. Bellia Jr.; nieces Margaret Monan Finnegan and Kathryn DeSprit; and cousin Cynthia L. Egan. He was predeceased by his parents, Edward and Mary Ward Monan; his brother, Edward Jr.; his sister, Gertrude Cheeley; and his niece Maureen Bellia. The 1960s were not a good time to be a college president. Normally placid campuses, which outsiders might think of as calm preserves of quiet contemplation punctuated occasionally by harmless high jinks, had become sites of turmoil and even violence. The toll this new era of strife took was apparent everywhere. Long-time presidents at the University of Chicago and at Columbia were driven from office amid controversies over the expansion of their institutions into surrounding neighborhoods. The president of Cornell stepped down after only six years following a building takeover by students, some of whom were photographed carrying rifles. Clark Kerr, the highly respected leader of the University of California system, had become an issue in Ronald Reagan’s campaign for governor, and when Reagan was elected, Kerr quipped that he was “fired with enthusiasm.” Harvard’s Nathan Pusey cut short his tenure after having to call in city and state police to end a sit-in at his office. And most terribly of all, the president of Kent State University in Ohio, who had ambitiously put up new buildings, enhanced the school’s research profile, and established an honors college, decided to retire after four students were shot and killed by National Guardsmen during an anti-war protest on the campus. Apart from dramatic episodes of this kind, turnover was still the watchword for college and university presidents, and transitions might cluster together, coincidences evident to even casual readers of the newspapers. So it was in eastern Massachusetts with the opening of the school year in September 1972. “New Leaders Tackle Woes of Academia,” the headline in the Boston Globe said one morning, providing short biographies of five new presidents, each of whom was taking command at a local institution. Brandeis, Wellesley, Radcliffe, and what was then known as Southeastern Massachusetts University (the University of Massachusetts, Dartmouth today) were all under new management, and so was Boston College. The newcomers bravely professed to be looking forward to their responsibilities, and they had the advantage of relative youth. Marver Bernstein of Brandeis was the oldest at 52, Matina Horner at Radcliffe the youngest at just 32. James Donald Monan, SJ (he never used his first name), was 48, and he was coming from the position of academic dean and vice president at Le Moyne College in Syracuse, New York. Internal Jesuit dynamics–New York and New England were separate “provinces,” whose members stayed mostly on their own side of the border–had limited the time that Monan had ever previously spent on the campus he was now expected to lead. And from the beginning, his inbox was full. Like so many other institutions, Boston College was in the midst of multiple transitions, some of them turbulent, and the immediate past had offered reasons enough for pessimism. A general student strike, prompted by a proposed sharp rise in tuition, had shut down classes for the better part of a semester two years before. Several decades of construction (new dormitories and classroom buildings) had left both specific project deficits and longer-term debts. The University, one faculty member said, had been run like a mom-and-pop grocery store: Money came in and money went out, but it was hard to gauge overall institutional health, or even solvency. Regular alumni giving and other forms of outside support were anemic, and efforts to improve were impeded by near-constant staff changes. “A different face comes through the door every time,” a sympathetic potential donor complained. Still, the school was turning in some new directions, and these gave signs of hope. Under Monan’s predecessor, W. Seavey Joyce, SJ, the crucial decision had been made to admit women, previously confined to only certain programs, to all the schools of the University, thereby doubling the pool of potential applicants overnight. Without abandoning its traditional connection to the greater Boston area, the University had also begun to attract better students from farther away, and the faculty too was improving in quality. Possession of the terminal degree in the appropriate field, a kind of luxury in the past, was now required for the hiring and retention of teachers. Once, the trustees had all been Jesuits, meeting rarely to fulfill minimal legal requirements, but now an expanded board, mostly lay men and women with extensive ties in business, education, and public life, was being put in place. They brought new levels of professional advice and support to bear on the institution’s management. After the rocky times, things were stabilizing. But would mere stability be enough? The real challenge for the new president was not survival, but whether the institution would grow into something greater. For J. Donald Monan, that question had a clear answer. The reading began by taking stock of the situation he was walking into and laying out the steps that would follow. “I had had enough experience at every level of university life,” he recalled later, to recognize the challenge Boston College faced, and “enough enterprise to allow me to undertake it.” To that end, he immediately formed a University Academic Planning Council to set the course for the future. The very idea of long-range planning was relatively new at Boston College, as indeed it was on most campuses. At the time, many would even have wondered whether that kind of strategic thinking was necessary. Universities just did what they did, didn’t they? Students came, classes were taught, graduations were held, athletic teams won and lost. Things next year would be pretty much as they had been this year. In the last third of the 20th century, that presumption had obviously become inadequate, and so Monan charged the council of 25 people, including 10 undergraduate and graduate students, to evaluate specific programs. But it also had to help articulate a larger vision. “After the storms and tempests of the last eight or 10 years,” their final report would say, “it is time to set a new course.” The new captain would steer that course. To begin with, the traditional commitments of Boston College were reaffirmed, with its Jesuit character remaining at the core. A Jesuit university, Monan would say, “exists to share an appreciation of the illuminating power” that came from recognizing “the nobility of intellect and faith, and the continuity between them.” With the goal of sustaining that insight, no effort would be spared to attract “committed and professional scholar-teachers” from within the order. The school’s wider religious orientation was “not narrow or restrictive, but generous and open,” and it would continue to be so. Undergraduate education was the highest priority, with a stress on the “value dimensions” of all branches of learning, while at the same time “selective excellence” in graduate programs would be encouraged. In the hiring of new faculty members, active research scholars were of course desirable, but the planning committee insisted “strongly and unequivocally” that teaching ability was the decisive requirement: The brilliant scholar who could not communicate ideas in the classroom was not acceptable. These and other high-minded ideals had to be realized in specific programs, and almost no aspect of University life was overlooked. The student body would expand modestly, though not so much that “personalized instruction” and “humane living conditions” were sacrificed. Even the plans of particular academic departments were discussed: Philosophy should rely less on graduate teaching assistants; psychology should explore a five-year program awarding a BA and an MA at the same time; the social work school might consider establishing an undergraduate program. More than 50 pages of the council’s report were devoted to this kind of detailed analysis. Not all ideas proposed were wise or feasible. Still, the mere consideration of them offered guidance for what the University might become. The ideas that Monan and his planners rejected would have produced a very different Boston College from the one of today. A dramatic increase in the number of tuition-paying students, for example, copying the model of the large American state universities, might have been tempting for an institution just emerging from budgetary uncertainty. But that path was not taken: The large lecture class of four or five hundred students, who saw their professor only from a distance, would not be part of the teaching and learning experience at Chestnut Hill. Similarly, insistence that the faculty consist of “scholar-teachers” foreclosed other options. Some universities sought academic “stars,” public intellectuals better known off campus than on and kept as far away from most students as possible. That, too, was unacceptable. Both in what it decided to do and in what it chose not to do, Boston College entered the nearly quarter-century tenure of its new president with a clear sense of the kind of university it wanted to be. 1. Speaking on April 22, 1986, at the dedication of renovated Bapst and Burns Libraries. 2. With (from left) former Irish Prime Minister Garret FitzGerald, U.S. House Speaker Thomas P. O’Neill Jr. ’36, and President Ronald Reagan, in Washington, D.C., March 17, 1986. 3. At the 1988 dedication of Conte Forum. 4. At the dedication of the O’Neill Library on October 14, 1984, flanked by David S. Nelson ’57, JD’60, H’79, chair of the Board of Trustees, and O’Neill. Click images to enlarge. Together, the three saw to it that budget deficits remained a thing of the past, and they initiated what would prove to be an uninterrupted building boom: seven new residence halls; replacement of separate basketball and hockey arenas with a combined facility; expansion of the football stadium; a theater and performing arts center; a new chemistry building; a massive new library, providing an adequate home for the University’s intellectual assets for the first time in its history. Renovation was part of the plan too, beginning with Gasson Hall, the University’s visual signature, and the carving out of a home in Devlin Hall for the newly established McMullen Museum of Art. The campus had consisted of about 60 buildings when Monan arrived as president; when he retired, it had more than 90, some of them on the campus of the former Newton College of the Sacred Heart. Consolidation of that previously independent institution into Boston College in the middle 1970s would not have been possible without the sophisticated managerial skills that marked Monan’s tenure from the beginning. The professionalization of nearly every office on campus–from finance to enrollment management to public relations to information technology–ensured that progress once made could not be undone. Paying for all this required new thinking and a new attention to fundraising. Everyone seemed to realize, as one outside consultant put it, that there was tremendous “latent, dammed up potential” at Boston College, if only it could be tapped. All universities of the era were bolstering their development programs (later rechristened “advancement”), and Monan joined them in 1976 by announcing the New Heights campaign. Though the hoped-for $21 million seems modest by later standards, it was at the time the most ambitious amount the University had ever attempted to raise. With trustee leadership and a steadily broadening base of support among alumni, the goal was outrun by nearly 20 percent. This established the pattern of exceeding expectations that would come to seem normal in the subsequent campaigns he oversaw and in those that have followed, but it was a normalcy that was hard won. In the same way, increasing external support for research conducted by faculty and students became a hallmark of the Monan years, amounting to nearly $20 million annually by the end of the century. A university that had once seemed on the financial brink had become a big and successful business, perhaps not the accomplishment that one might have expected from an expert on Aristotle. Tangible measures of success such as these were accompanied by intangibles that were every bit as important. The steady transformation of the school during the Monan years into a truly national university was perhaps the most telling. From its founding at the time of the Civil War, Boston College had always been “Boston’s College,” closely identified with its surrounding local community, and it remained so for decades. As late as 1960, two-thirds of the student body still came from the city of Boston or its immediate suburban ring. With the decision for full coeducation, however, and increasing efforts to attract top students no matter where they lived, the geography of applicants widened, spreading first down the East Coast and then moving even farther afield. These incipient trends rapidly picked up momentum in the Monan presidency and became permanent. In the early 1980s, the number of high school seniors applying from Florida ranked that state in 13th position, with California 15th; during Monan’s final year, California had moved up to fifth place (behind Massachusetts, New York, New Jersey, and Connecticut) and Florida was seventh. The reputation of the University was no longer only a local one. James M. O’Toole ’72, Ph.D.’87, holds the Charles I. Clough Millennium Chair in History at Boston College, and is the award-winning author of books on American Catholic history and culture, including The Faithful: A History of Catholics in America (2008). 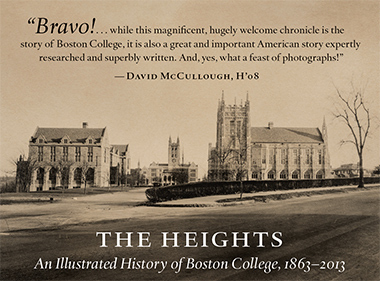 He recently completed a history of Boston College. The following was edited from the homily delivered at a Mass of Christian Burial in St. Ignatius Church, on March 22, 2017. The first time i attended a Mass celebrated by Fr. Monan, and at every other of his Masses afterward, I would hear him say, “Eucharist means thanksgiving.” So, let us heed his words. We pray in thanksgiving for his scholarship. J. Donald Monan, SJ, was an Aristotelian scholar who pondered the vital questions: What does it mean to be human? How do we relate to the transcendent? How shall we live together? He was the author of Moral Knowledge and its Methodology in Aristotle, which shed light on the Nicomachean Ethics, whose truths undoubtedly shaped his intense engagement with the world. He followed his long Jesuit course of studies with a doctorate in philosophy from the University of Louvain, in Belgium, and postdoctoral work in Paris and Munich. But his interest went beyond ancient philosophy. Fr. Monan particularly admired the work of the 20th century French existentialist philosopher Gabriel Marcel. In his book Creative Fidelity, Marcel wrote, “A truly alive person is not merely someone who has a taste for life, but somebody who spreads that taste, showering it, as it were, around him.” Don Monan was truly alive by this definition. We pray in thanksgiving for his graciousness. Knowledge without wisdom can be cold comfort. Knowledge with wisdom is full of human warmth. No matter where you stood in life, Don treated you with warmth and respect. And he was always appreciative. Kim Noonan, the Jesuit community nurse, would accompany Don to his many doctor’s appointments over these past months. She recounted that one day the wait for the doctor unexpectedly extended through lunchtime. Kim offered to share her lunch and gave Don half a sandwich. He started eating and said, “Thank you so much. This is delicious.” It was a peanut butter and jelly sandwich. I am sure that each of us here can recall examples of Don’s goodness. He was the quintessential gentleman. And, despite his many commitments, he was always an encouraging presence in the Jesuit community—I can certainly testify to that. And how many alumni remember with fondness his fatherly presence? Don had a remarkable ability to balance compassion with competence. We pray in thanksgiving for his practical wisdom. As you probably know, Don was a native of upstate New York, and fell in love with hockey at a very early age. I am reminded today of a quote attributed to Wayne Gretzky, “A good hockey player plays where the puck is. A great hockey player plays where the puck is going to be.” In 1972 when he came to a local college that was struggling to survive, Fr. Monan played where the puck was going to be. He saw possibilities that no one else saw. He was a visionary and during his long tenure as president and ever since, that vision has become a reality. We pray in thanksgiving for his life of service. Fr. Monan’s concern and commitment went beyond Chestnut Hill. In this regard, he exemplified the mission of the Society of Jesus. We Jesuits are not to remain in the sacristy; we are to live in the world out there. He believed that we are to engage the marketplace of ideas, in dialogue with people of different faiths and ideologies, both on campus and off campus. We are to find common ground because we are steadfastly committed to the common good. Ever the Aristotelian, Fr. Monan engaged himself in the polis. He brought the best of the priesthood to the public forum, bringing to bear his analytic skills, urging people to be attentive to the better angels of their nature, bridging differences, keeping in mind the good of all. He was committed to his vision for Boston College and, with similar passion and zeal, to his vision for Boston as a place of civility and culture, a place of opportunity not just for the few, but for the many, especially the most vulnerable. He was dedicated to institutions in the Commonwealth, especially the court system. And, most dear to my heart, he was committed to hold up as exemplars those who put themselves in harm’s way for the good of others, such as the courageous men and women, Jesuits and lay, who spoke truth to power in El Salvador and paid the ultimate price. They modeled for him the responsibility of intellectuals to face the most pressing issues of the day as harbingers of reason and truth. Don Monan, in partnership with people of good will, was relentless in calling to accountability those who perpetrated that violence and murder. He believed in a faith that does justice. In the sixth chapter of John’s Gospel, Jesus tells his disciples that He alone is their strength and sustenance, in this life and the next. And He teaches them that it is the will of the Father that everyone who sees the Son and believes in Him may have eternal life, and that, on the last day, He shall raise them up. At this Eucharist we give thanks that Fr. J. Donald Monan of the Society of Jesus rises today through the God to whom he dedicated his life. The former dean of the Lynch School of Education, Joseph M. O’Keefe, SJ, was recently named rector of Ciszek Hall, the residence for Jesuit scholastics at Fordham University. The essay that follows was drawn from a talk delivered by Fr. Monan at the annual dinner of the Boston College Fides Society on May 20, 1984. The concept of a religiously affiliated university is a difficult one. It attempts to combine two of the most powerful and original forces in world culture: religious faith that responds to God’s communication of truth in history, and the controlled and methodic disciplines of the sciences. They stand separate, autonomous; and in their individual worth, they merit a freedom to pursue their own paths and to be answerable to their own authorities. Because they are so radically different, the power of religious faith and the power of human understanding carry seeds of tension—of total incompatibility, some would say. Religious faith, for example, offers calm assurance of the ultimate origin and meaning of human existence. By contrast, the intellectual disciplines draw their power from an urgent need to question and inquire and to cross old frontiers. Any combining of these forces will be difficult. And yet, if one were to become irrelevant, or adversarial to the other, both would suffer irreparably, as would the society that depends upon them. The French philosopher Gabriel Marcel likens religious faith to the unconditional, perduring love of one person for another. Marcel compares faith to human love because of two of love’s characteristics. It can be spoken once-and-for-all in a single word, and yet be clarified and deepened and expanded throughout a lifetime. Love is a promise open to a future. The conditions for love’s growth are many. It grows in those questionings that accompany the making of friends, the birth of children, the evolution of a family’s social and economic life. It grows, too, in those situations where new questions are addressed by spouses to each other—not in a spirit of doubting love, but with an honest concern for light not seen, for an illumination equal to a new situation. In short, love remains constant without losing its mobility; it does not cease to be a light even while asking new questions that are part of life itself. This same resilience and mobility and capacity for growth is the mark of a living faith. Faith grows and develops not only in isolation but in sincere engagement with science and industry and the arts. Social and cultural and historical situations prompt questions not in any spirit of unfaith or of retracting a trust, but with a genuine concern for light not seen, for an illumination equal to a new situation. Rather than be incompatible with Christian faith, the university and its questioning are an indispensable counterpart in the effort to keep faith commensurate with the age and ages of mankind. the point is that in the familiar living of human love there is room for sincere questioning, which neither suspends nor abdicates love once given, nor descends to the level of play-acting, where all the answers are known before the questions are asked. And in the serious business of living within faith, there is room for those questions that arise from an evolving science or culture or philosophy that are neither abdications of faith nor insincere role-playing. There is another characteristic of human love that can provide the formula for combining the disparate elements within the religiously affiliated university. The relationship of human love is never fixed or finished. It is always susceptible to growth and, therefore, it is always fragile and leaves each person perpetually vulnerable. For that reason, human love calls upon the very best in both parties—the recognition that neither is self-sufficient, but paradoxically each depends upon the other if they are to be fully themselves. This calls for not a little humility, and much respect directed to the other. It calls for the willingness to receive as well as to give. And it calls for the willing acceptance of risk, without which nothing can be gained through growth because nothing can be lost. Over the course of time, these characteristics of love have not always been observed at religiously affiliated universities. Whenever either party, be it religious faith or the power of human sciences, lost courage or lost humility or lost the ability to respect and receive from the other, the vulnerable link dissolved. But human love still constitutes the leaven that makes human growth possible. And in a true sense the link between the religious beliefs and aspirations of a society and its university settings is a critical ingredient for the growth of culture. That link is as fragile and yet enriching as the link of love itself. The complete text of this talk was published in Echoes of a University Presidency (2008), a collection of Fr. Monan’s speeches.